The BGP industrial gas fired water heater, certified to operate both with natural gas and LPG, has been designed and built to meet the DHW requirements of large systems (sport centres, hospitals, large community facilities, camp sites, hotels, rest homes, gyms, saunas etc.) and small businesses (beauty centres, hairdressers, laundries etc.). BOILER – Made of very thick, high quality steel sheet metal, ensuring a higher resistance to corrosion, thanks to an accurately applied double glass ceramic coating. Thermostatic valve fitted with a regulator and a safety valve which prevents gas leaks should the pilot flame go off. Cathodic protection. The cathodic protection of this water heater is carried out by 2 sacrificial anodes correctly sized according to the heater capacity. As an optional, a permanent sacrificial anode can be fitted. 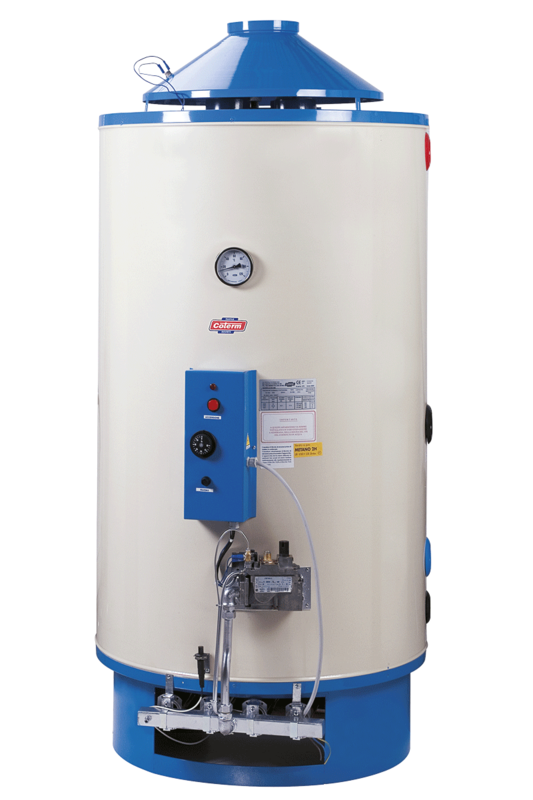 Fill in the form below to be e-mailed the BGP 300-400-500 WATER HEATER technical data sheet. Thank you.